The Rugged library aims at providing direct and inverse location to perform full ortho-rectification of images and correlation between sensors observing the same area. 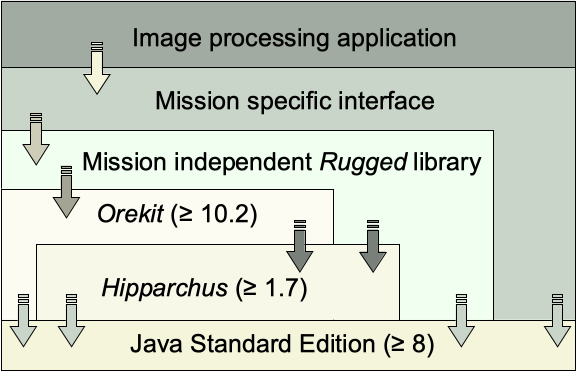 Rugged, a pure Java library, depends only on the Java Standard Edition version 8 (or above), Orekit version 9.3.1 (or above) and Hipparchus version 1.4 (or above) libraries at runtime. As a an intermediate level library, Rugged aims at being used in very different contexts which cannot be foreseen, from quick studies up to critical operations.